This delightful house is only a 5 minute walk from Yallingup Beach and has wide ocean and national park views from the sheltered balcony, open living area and bedrooms. The rear of the property adjoins the Leeuwin National Park with Caves House only a 5 minute walk away through a bush trail. The Cape to Cape walk track is also easily accessible from Yallingup. With 4 comfortable bedrooms and 2 well equipped bathrooms this house can sleep up to 8 people , but be just as cozy with a couple or small group. All linen,doonas, towels etc. are provided to ease the load and make your transition to holiday mode immediate. 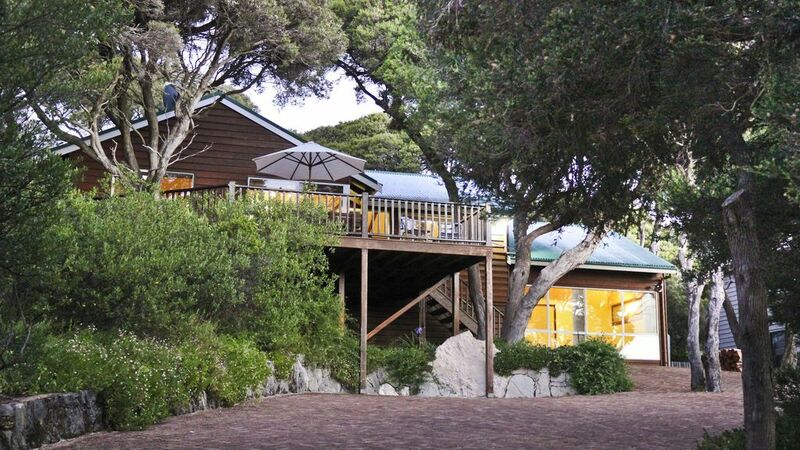 Two of the bedrooms have ocean views and the other bedrooms look out onto the garden and the national park. There are two bathrooms with polished wood floors, one of which has a bath. The spacious open Living area with polished floorboards and pitched ceilings adjoins a spacious timber deck perfect for afternoon BBQs or morning breakfasts overlooking the bay. A Wood fire keeps the house toasty in winter and pedestal fans are provided for cooling in the summer months if required. *4 large bedrooms each with built in robes, Two have a queen sized beds, one a double (+single), and the fourth can sleep three persons (1 bunk, 1 single). Absolutely loved the home. Stunning location, amazing outlook. But, we originally booked for 2 couples and then another join. We were quoted for the house and honestly adding another couple we thought would not be a problem (it sleeps 10), but we had to pay extra - so it sleeps 10 and there was only 6 of us but we had to pay more! We have a property down south as well and when we list it we state the actual accomodation amount and that is it - as long as there is no more than we state we do not care. Thank you Gabby for taking the time to review. Everything was fantastic, easy to find the place and had a great time watching the sunset on the front deck. Great amount of kitchen items to cook for ourselves and such an easy stroll up to caves house. Found the kitchen lights a little tricky to locate (under the bench near the bins) but everything else easy! Great house and location with beautiful ocean view. The house is really lovely with everything we needed. Beds were not very comfortable and so we had to pad the mattress with a couple of blankets to try to soften it. TV volume was too low also and we struggled to hear it, the windows need a good clean. Otherwise a very nice house and the proximity to the ocean and Caves house and the general store was a bonus. Great ocean views from the deck and the national park at the back was also lovely to see. Thanks for taking the time to write a review Moreen. Sometimes if the TV and Satellite volume controls are not in sinc it seems the volume is low, although it just needs one to be adjusted. Apologies for this. The comfort of Bedding/mattresses are always a very personal response ( others complain if the mattress is too soft? ), nothing beats your own bed when you've been travelling i agree! Property was easily accessible plenty of parking, well equiped , roomy enough for the 7 of us staying plus friends coming and going over the time we were there. The house was clean though the blinds in the kitchen and at the front door need cleaning as does the front door frame and sliding door tracks front door . The door in the main toilet also was a bit grubby , otherwise everything else was clean and well presented . We would definitely return to this property. We enjoyed our weekend stay. Great location close to the beach. The house itself was very average with only the very bare minimum . We really enjoyed our stay. View was fantastic. emenities well catered for. Downstairs bedroom however a little cold. Other than that we would definitely stay again.